This issue explores representations and meanings of the bed, bedroom space, and sleep in history, the arts, film and literature. 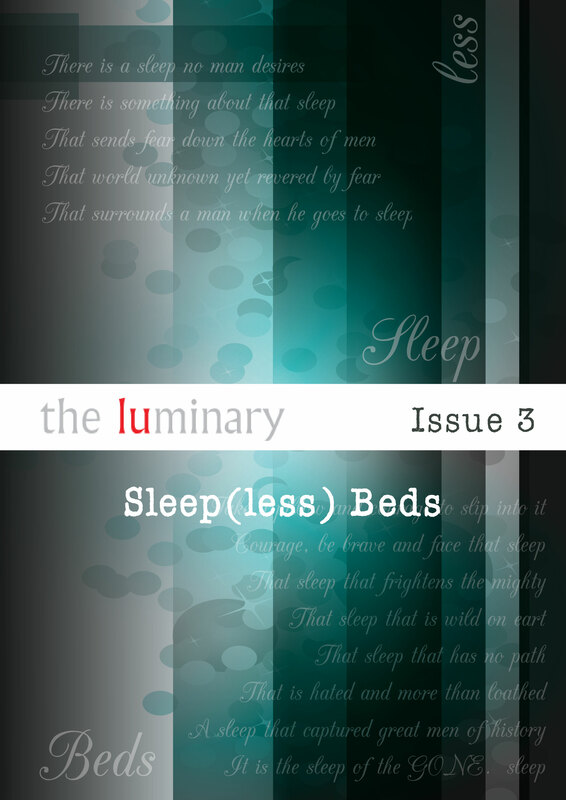 Our contributors examine the functions, rules, morals, design, and meanings given to representations of ‘the bed’ and sleep across a range of disciplines. Read online by following the links below or download this issue as a PDF. This series: ‘Ego ideal’ arises from my experience of trying to run away from parts of my life by abolishing all pictures or anything that reminded me of those days. In the process of destroying and tearing apart photographs that caused me shame or anger, surprisingly I discovered ways to see these experiences differently. Not hating them anymore, I decided to keep those pictures and use them in my painting and collage pieces. As a base for the new works, I used a second-hand book as sheets of paper, filled with the previous owner’s dreams and ideas. On top of these I added my own dreams, nightmares and life experiences. Using second-hand paper is like sleeping in the other person’s bed (room) and seeing their dreams start to enter in our nightlife; like borrowing part of someone’s soul. In this project I drown in my real life, dreams and nightmares until it is impossible for me to make a clear boundary between them. My ‘Ego Ideal’ is lost somewhere between those layers. However, we are what we represent: a careful or careless selection of different layers. Our everyday lives are composed of movements back and forth behind the scenes and the stage where we present our ‘selves’. Society does not provide us with clear in­structions of how to act. Indirectly, society confines and forms us through a process of representation, mediated by language and other symbolizing systems. These systems, historically, construct and at the same time confine our experience of forming our ‘Ego Ideal’. This article deals with the real and symbolic centrality of the bedroom in the development of independent music in the UK (1979-1995). Drawing from Bachelard’s Poetics of Space (1958), Bollnow’s Human Spaces (1953) and also cultural and music theorists such as Susan Stewart and Wendy Fonarow, I argue that the bedroom can be read as (1) a space of creation, (2) a place of mediation and self-mediation and (3) a political space. The bedroom is notably, but not exclusively, examined in the songs of The Smiths and the later ‘bedroom pop’ movement (as embodied by Sarah Records). Dr. Michael Greaney has studied at the Universities of Oxford, Newcastle and Lancaster. His research interests lie in modern/contemporary fiction and theory. His first book, Conrad, Language, and Narrative (Cambridge University Press, 2002), received the Joseph Conrad Society of America's Adam Gillon Award for the most significant work in Conrad studies from 2001-4. Contemporary Fiction and the Uses of Theory (Palgrave, 2006) is a study of the reception and representation of theoretical ideas in literary fiction since the 1960s. He is currently writing a book on the representation of sleep and sleep-related states in the modern novel. Fatemeh Takhtkeshian is a PhD student at the Lancaster Institute of Contemporary Arts (LICA), Lancaster University. Katharina Rein holds an M.A. in Cultural History and Theory from the Humboldt-University of Berlin, where she currently works on her PhD dissertation concerning media and magic in the late 19th century. She is employed as a research and teaching assistant at the Department of Media Studies of the Bauhaus-University of Weimar. Katharina Rein published several articles on horror film and other topics of cultural history in German and English as well as a monograph on the horror classic "A Nightmare on Elm Street" (1984) (in German). Dr. Filip Krajník has recently gained his PhD in English Literature at Durham University. The topic of his dissertation is the dramatic rôles of sleep and dreams in Shakespeare’s plays; among his research interests is the social, intellectual and cultural history of dreaming from antiquity to the early-modern period. He has also translated a number of English and American works of fiction into Czech and is a lecturer in literary translation at the English Department at Palacký University, Olomouc (Czech Republic). Erkan Ali recently gained his PhD at Lancaster University. His interests are in visual culture, social theory, written and visual forms of representation, semiotics, but especially the role of photography in sociology. Drawing primarily on the work of Roland Barthes, Erkan’s PhD thesis was concerned with developing a new concept for thinking sociologically about the relationships that can exist between texts and photographs in works of social science, art, photojournalism and documentary. He calls this concept ‘lamination’. The main point of the concept is to argue that texts and photographs are mutually-dependent in the work they do in conveying sociological narratives, rather than arguing for the dominance of either text or image in the relationship. Elodie Amandine Roy is currently in the third year of her PhD in Music at Newcastle University. Her research focuses on the material culture of music in the twentieth-century. She is especially interested in the relationships between media, matter and memory. Sarah Ann Robin is studying for her PhD, in history, at Lancaster University. Cecily Davey holds an MLitt in Women, Writing and Gender and is currently a PhD scholar and tutor at the School of English, University of St Andrews. Her thesis is entitled ‘Bloodsong: Dream, Memory and the Body in the Fictions of Hélène Cixous’ and her research interests include 20th - 21st century women's writing in English and French, memoir, feminist literary theory and bodily imagery. Read more at: http://st-andrews.academia.edu/CecilyDavey. Cover art by Sara Gancho, Lancaster Institute for the Contemporary Arts (LICA), Lancaster University. Sara can be contacted via s.gancho1@lancaster.ac.uk, and her work can be viewed here. We would also like to thank Dr. Michael Greaney, Professor Lynne Pearce, Professor Graham Mort, Dr. Brian Baker and Professor John Schad for their support and input, as well as our peer reviewers. Thanks also to Distinguished Professor of Literature, Terry Eagleton.